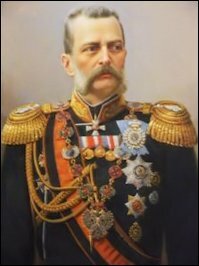 It is a well-known fact that Grand Duke Vladimir Alexandrovich, President of the Imperial Academy of Arts, had good taste, was an avid student of history, and was frequently an adviser to his older brother, Emperor Alexander III (1845-1894). 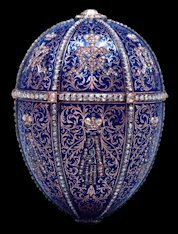 From a letter between the two brothers it is known the surprise in the 1885 Hen Egg by Fabergé was changed. 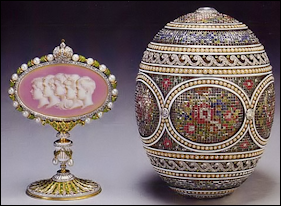 (Fabergé, Proler, and Skurlov, Fabergé Imperial Easter Eggs, 1997, 92-4). What it is not known is Vladimir helped his ruling brother in 1887 with the order of the Third Imperial Easter Egg. The recently discovered egg was shown in London for only four days during April 2014. Милостивый Государь Николай Степанович (Петров)! По поручению ВК Владимира Александровича заказано было ювелиру Фаберже пасхальное яйцо с часами, подставки в стиле Людовика XVI. 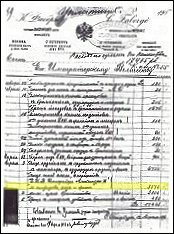 Яйцо это по исполнению доставлено Государю Императору. Ныне Фаберже доставил счет в сумме 2 160 р, который Его Императорское Высочество поручил мне препроводить к Вашему Превосходительству. In our auction catalog research we found four photographs of the surprise – a folding miniature frame. Whereabouts of the frame is currently unknown, however, we hope the surprise may be alive and well in the care of an unsuspecting collector. 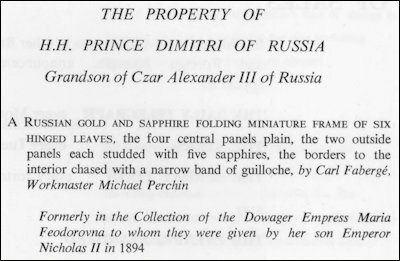 Provenance: Prince Dimitri, Grandson of Empress Maria Feodorovna. Bought by Wartski for 420 Guineas. The sapphires match the deep royal blue of the egg’s champlevé enamel and the red gold of the object is a match to the red gold of the elaborate patterns engraved within the enamel. 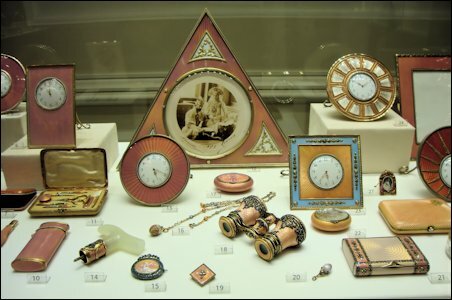 Tatiana Muntian, Senior Fellow at the Moscow Kremlin Museum, published an article highlighting Fabergé eggs in celebration of the 400th Anniversary of the Romanov Dynasty (“Symbols of a Vanished Empire,” символы исчезнувший империи, Antiquariat, December 2013, 10-15. In Russian). Included in the article is new information about Imperial Easter Eggs for the years 1912, 1914, and 1915 for which no invoices are known. 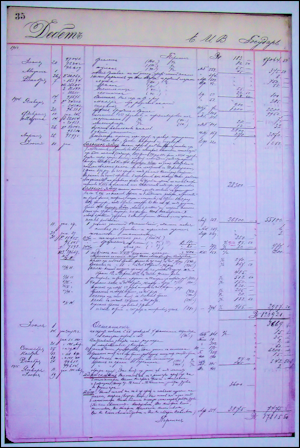 The newly found documents enable researchers to fill in some of the blanks existing to this day. 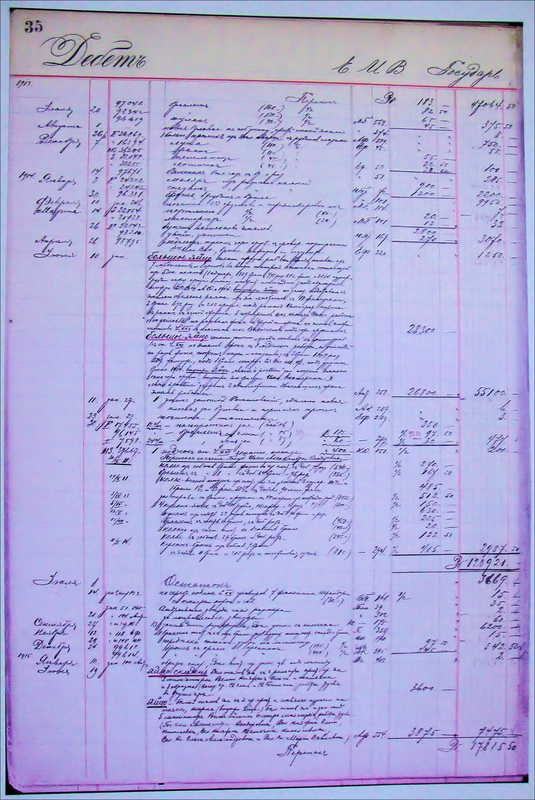 The ledger discovery was made possible thanks to the help of Sergei Pavlovich Balan, Deputy Director of the State Archive of the Russian Federation. 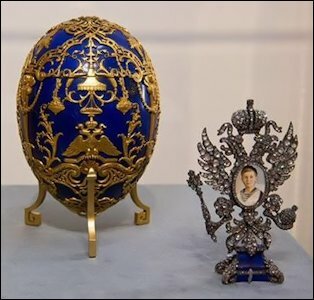 Along with brief descriptions for the eggs, one learns the 1912 Napoleonic Egg was given by Emperor Nicholas II to his mother Empress Maria Feodorovna (MF) on March 24, 1912, and the Emperor paid the Fabergé firm 22,300 rubles (r.) for the egg on June 26, 1912. The two eggs made for Easter 1914 are the last eggs presented during peacetime – the Mosaic Egg made for Alexandra Feodorovna (AF, Collection of Her Majesty Queen Elizabeth II) cost 28,300 r., and the Catherine the Great Egg made for Marie Feodorovna (Post Collection, Hillwood Museum, Washington, DC) cost 26,800 r.
The 1914 Catherine the Great Egg at 26,800 r.
The 1913 Winter Egg at 24,600 r.
The 1912 Napoleonic Egg at 22,300 r.
Before this new publication, the Winter Egg was thought to have been the most expensive Imperial Easter Egg. 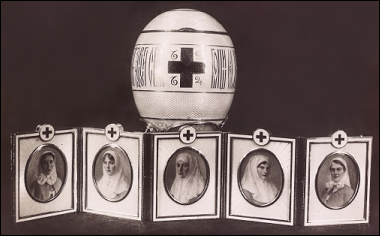 For 1915, the eggs for the Empresses Marie Feodorovna and Alexandra honored the dedicated nursing work of the Romanov women during war time, and the eggs are both called “Red Cross”. 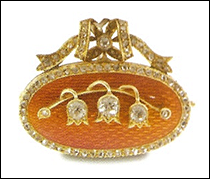 Marie Fedorovna’s egg is known as the 1915 Red Cross Portraits Egg (Pratt Collection, Virginia Museum of Fine Arts, Richmond, USA), it cost 3,875 r. The egg for Alexandra is the 1915 Red Cross Triptych Egg (India Early Minshall Collection, Cleveland, USA), it cost 3600 r.
Riana Benko, a new Fabergé enthusiast from Slovenia, translated the cost of Imperial eggs displayed on a chart during the 2014 St. Petersburg Fabergé Symposium. Eggs presented before 1900 were not included in the chart. No Imperial eggs were presented in 1904-05 due to the outbreak of the Russo-Japanese War in January 1904 and the political unrest in Russia in 1905. The additions in bold were made by the editors. 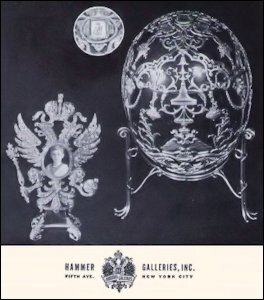 Resources consulted to verify the statistics cited below are from the 2011 revision by Will Lowes of the chapter entitled, The Fabergé Eggs, originally published in Lowes and McCanless, Fabergé Eggs: A Retrospective Encyclopedia, 2001, and an email from Valentin Skurlov, Independent Fabergé Researcher, St. Petersburg. 1. Mosaic Egg (1914, AF) 28,300 r. Colonnade Egg (1910, AF) (bold = not on chart) 11,600 r.
2. Catherine the Great Egg (1914, MF) 26,800 r. 13. Alexander III Commemorative Egg (1909, MF) 11,200 r.
3. Winter Egg (1913, MF) 24,600 r. 14. Peter the Great Egg (1903, AF) 9,760 r.
4. Napoleonic Egg (1912, MF) 22,300 r. 15. Love Trophies Egg (1907, MF) 9,700 r.
5. Romanov Tercentenary Egg (1913, AF) 21,300 r. 16. Clover Leaf Egg (1902, AF) 8,750 r.
6. 15th Anniversary Egg (1911, AF) 16,600 r. 17. Peacock Egg (1908, MF) 8,300 r.
7. Tsarevich Egg (1912, MF) (should be AF) 15,800 r. 18. Rose Trellis Egg (1907, AF) 8,300 r.
8. Alexander III Equestrian Egg (1910, MF) 14,700 r. 19. Royal Danish Egg (1903, MF) (still missing in 2015) 7,535 r.
9. Bay Tree Egg (1911, MF) 12,800 r. 20. Swan Egg (1906, MF) 7,200 r.
10. Standard Yacht Egg (1909, AF) 12,400 r. 21. Trans-Siberian Egg (1900, AF) 7,000 r.
11. Alexander Palace Egg (1908, AF) 12,300 r. 22. Flower Basket Egg (1901, AF) 6,850 r.
12. Moscow Kremlin Egg (1906, AF) 11,800 r. Cockerel Egg (1900, MF) 6,500 r.
Total: 219,700 r. Empire Nephrite Egg (1902, MF) (still missing in 2015) 6,000 r.
Gatchina Palace (1901, MF) 5,000 r.
Red Cross Portraits Egg (1915, MF) 3,875 r.
Red Cross Triptych Egg (1915, AF) 3,600 r.
Five eggs for Maria Feodorovna (MF) 101,200 r. Nine eggs (MF) 65,310 r.
Seven eggs for Alexandra Feodorovna (AF) 118,500 r. Seven eggs (AF) 55,860 r.
Temporary venue dates change, checking in advance is advised. 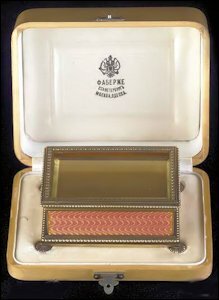 Permanent and temporary exhibitions are announced as they become available on the Exhibitions page of the Fabergé Research Site. 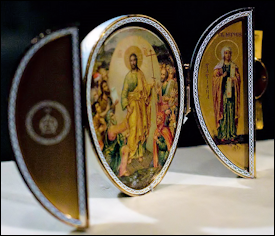 Fabergé Revealed is the traveling exhibition from the Virginia Museum of Fine Arts, Richmond. 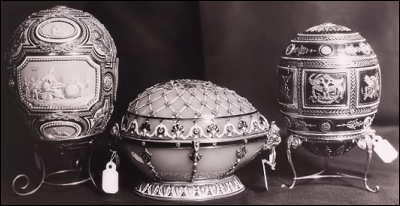 Valuable Eggs from Imperial Russia from the Liechtenstein Landesmuseum Collection includes the Kelch Apple Blossom Egg. Map of the Russian Empire. Exhibition includes the 1900 Trans-Siberian Railway and the 1913 Romanov Tercentenary Easter Eggs by Fabergé. 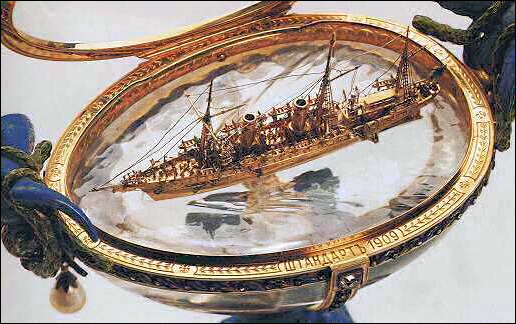 Fabergé, Jeweler to the Tsars is the traveling exhibition from the Virginia Museum of Fine Arts, Richmond. Fabergé objects from various Hessian collections will be on view. Virginia Museum of Fine Arts will be the first museum in the United States to exhibit works from its permanent collection when its world-renowned Fabergé collection travels to China. 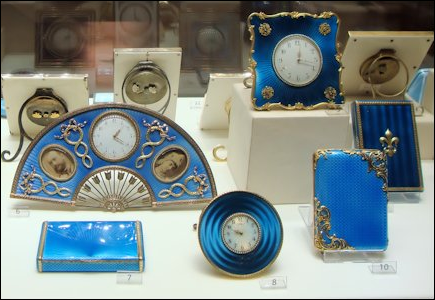 Leading Fabergé dealers were featured in news stories – Wartski in London and A La Vieille Russie in New York. The 2014 ALVR Winter catalog, Antique Jewelry, Fabergé, and Works of Art, is available on the web, or in hard copy by request. DVD (now available commercially) includes dramatized reconstructions of some of the biggest events in art history, surrounded by carefully scripted investigations and scholarly talking heads, and all with just a breathy touch of hyperbole – not that any of the stories featured in the six episodes needed any extra drama. (Review in “The Art Newspaper”.) 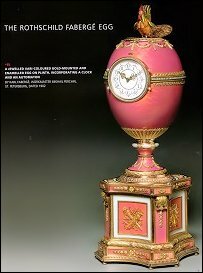 Fabergé Eggs, Episode 2, showcases interviews with Kieran McCarthy of Wartski, Cynthia Coleman Sparke of Bonham’s Auction House, and Toby Faber, author of Fabergé’s Eggs, The Extraordinary Story of the Masterpieces that Outlived an Empire, 2008. Pärnu, Estonia, the birthplace of Gustav Fabergé (1814-1893). Five generations of the Fabergé family have been painted by Vello Paluoja, a local artist, and presented to the Society of Pärnu Friends of Fabergé in existence for three years. 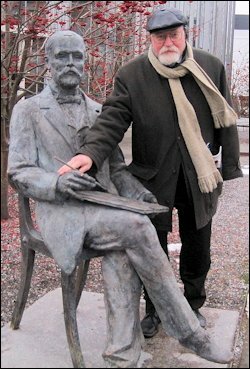 On January 3, 2015, a monument to Gustav Fabergé was unveiled marking the 200th Anniversary of the founder’s birth. A new memorial marker was installed in the Trinitatis Cemetery, Dresden, Germany, in memory of Charlotte Maria Fabergé (1824-1903), mother of Carl Fabergé, by the German-Russian Cultural Institute as part of the “Russian Connections in Dresden” project. 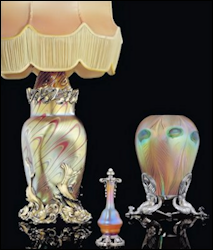 For details of three new books published by the Fabergé Museum see Publications. Three rooms dedicated to Carl Fabergé opened in the General Staff Building of the State Hermitage Museum (Courtesy of Paul Gilbert, Royal Russia News). 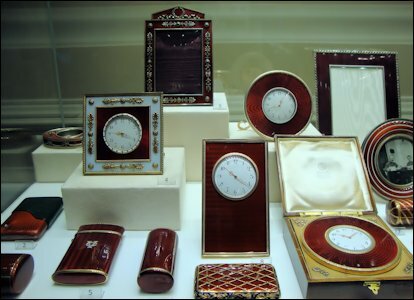 During the opening ceremonies of the anniversary celebration Vladimir Putin, President of the Russian Federation, presented two Fabergé objects to the museum – the 1902 Rothschild Egg Clock and the Alexander III 25th Wedding Anniversary Clock. 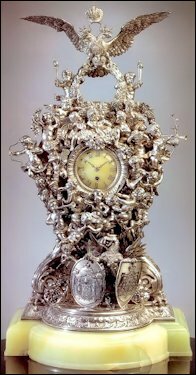 Previously owned by Alexander Ivanov and displayed in the Fabergé Museum in Baden-Baden, Germany. With the addition of over 150 new pieces, the Fabergé from a Snowflake to an Iceberg exhibition showcases 500 jeweled treasures from the world-renown McFerrin Collection. The growing collection is in two galleries introduced with a large genealogy wall chart of the Romanov family connected to the Danish and British Royal families. A snowflake symbol with a name indicates an object(s) related to the individual is part of the McFerrin Collection featured in show cases with the same name designations. A portrait gallery near the genealogy chart highlights some of the givers and/or recipients. At present there are no plans to update the 2013 catalogue raisonné written by Dorothy McFerrin and 11 contributors. 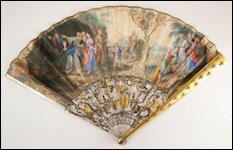 Recent acquisitions include art nouveau pieces (silver objects combined with glass, a specialty of the Viktor Aarne shop), and a just discovered Fabergé fan bringing the total number of fans in the collection to 12. 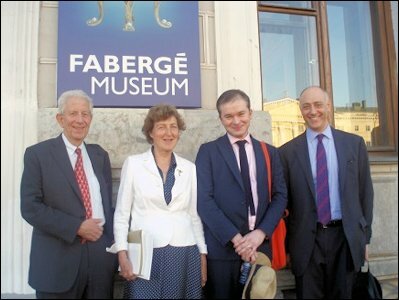 For more about missing Fabergé fans see Searching for Fabergé. 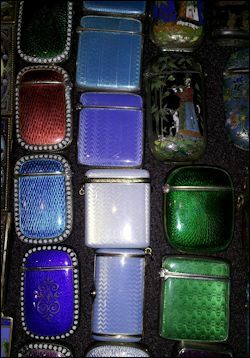 The traveling exhibition of 238 objects from the Pratt Collection was shown at the Detroit Institute of Arts, Peabody Essex Museum in Massachusetts, Montreal Museum of Fine Arts, is currently at the Bellagio Gallery of Fine Art in Las Vegas, and then is going to the Oklahoma City Museum of Art, and in 2016 to the Palace Museum, Beijing, China. 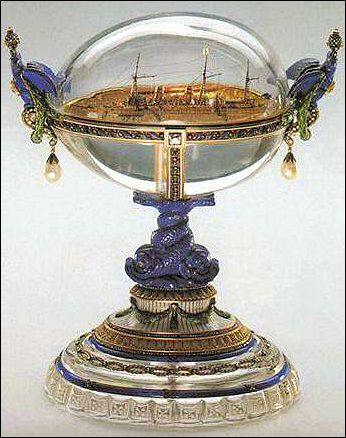 The Montreal Museum of Fine Arts produced a catalog, Fabulous Fabergé: Jeweller to the Czars. See Publications section of the newsletter. 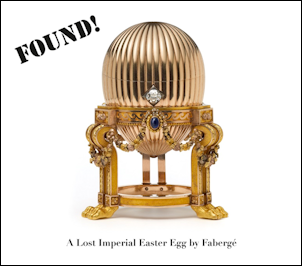 A small collection of Fabergé objects, including the Imperial Rock Crystal Easter Egg, is on display in the European art galleries, while the VMFA’s Fabergé and Russian Decorative Arts collection is on its international tour. All objects will be shown in the newly designed galleries in late 2016. Borodychyova, Irina, and Irina Polynina, Diamond Fund Guide published in two editions, is a guide with stunning photographs and explanatory text for the Russian Diamond Fund Exhibition permanently on view on the Kremlin grounds. Irina Polynina is also the author of a CD entitled, The Diamond Treasures of Russia, 2011. Muntyan, Tatyana with V.S. 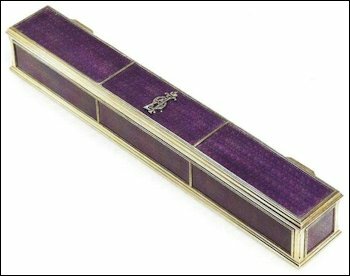 Voronchenko, general editor, Fabergé Masterpieces from the Collection of the Link of Times Collection is a revised soft-bound edition of an over-size slip-cased book published in 2004 under the authorship of Géza von Habsburg. In both editions the history for each of the Fabergé eggs is presented in detail. Fabergé Museum. St. Petersburg published by the Cultural-Historical Foundation The Link of Times gives a brief introduction to the Shuvalov Palace housing the Vekselberg Collection and introduces the reader to the highlights of the repatriated collection. 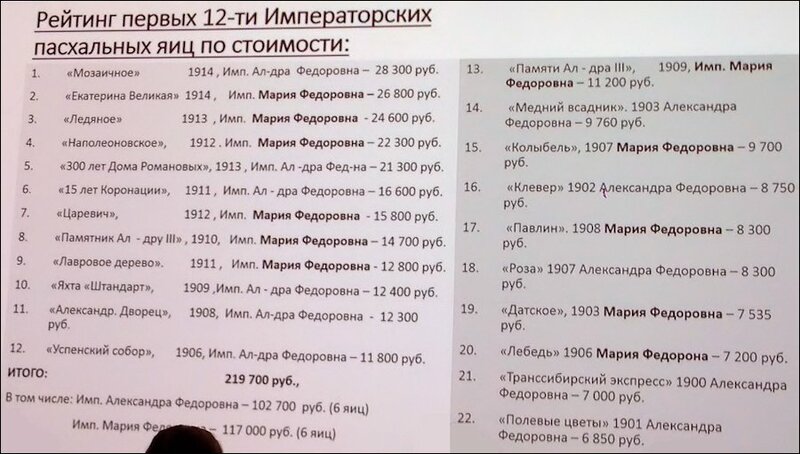 Fabergé Museum in St. Petersburg Exhibit Index, 2014, enumerates the contents of the 12 display rooms in the Shuvalov Palace. Each object entry includes the name of the object, location and time in which it was made, workmaster, and material used. There are no illustrations. 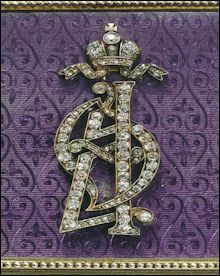 Fabulous Fabergé: Jeweller to the Czars was published to coincide with the traveling Pratt Collection from the Virginia Museum of Fine Arts shown at the Montreal Museum of Fine Arts. In collaboration with the French magazine L’Objet d’art, a special issue on the exhibition features main objects from the collection with commentaries by Fabergé scholars Géza von Habsburg, Ulla Tillander-Godenhielm, Carol Aiken, and other contributors. Also a French edition, Fabuleux Fabergé: Joailler des Tsars. Does the stand (Hammer catalog, ca. 1935) belong to another unidentified or even an existing Fabergé egg? 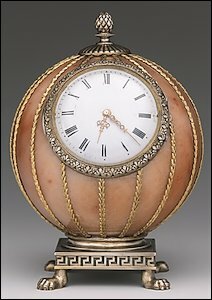 Are there other mix-ups in Fabergé stands? Are there other replica stands? Contact: Editors. Agathon Fabergé (1876-1951) was living in Finland at the time and was not producing anything, he was trading as an antique dealer. In St. Petersburg, Agathon did not have a master’s certificate allowing him to mark objects, nor did he have the right to assay in Finland. Whenever Agathon commissioned a piece while living in Finland (he often did), he used a local gold- or silversmith (Tillander, Tepponen, Kaksonen), who marked the object. Why has someone not written a children’s book with Fabergé animals? Ed. 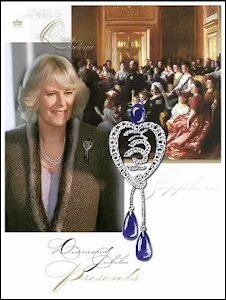 note: In 1994, the Fabergé Arts Foundation under the leadership of Mary Ann Allin and in co-operation with Margaret Kelly, Director, The Forbes Magazine Collection, produced Imperial Surprises, a Pop-up Book of Fabergé Masterpieces. A very delicate book for the young at heart, but regretfully not for children. (2) Diana Rosenthal writes: Thank you so much for your help in researching the spherical clock in the Matilda Geddings Gray Collection. My research on this object was part of a larger project for a graduate course offered at the Metropolitan Museum of Art’s Watson Library. sold for $156,000 in 2005. Where is the Missing Fan?